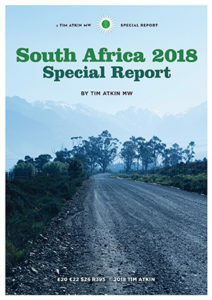 The sixth annual Tim Atkin South Africa Special Report is now out, the British journalist and Master of Wine awarding his first ever 100-point score in the New World to the Kanonkop Paul Sauer 2015 and 99 points to two whites: Alheit Vineyards Magnetic North 2017 and Sadie Family ’T Voetpad 2017. The report costs R395 and is available for download here. Thanks for this. But how about a bit of journalism as opposed to PR cut and paste job. I would like to know your thoughts opinions etc on Tim’s report. The scores are high, certainly a point or two across the board higher than your own. Paul Sauer you scored 94 points, he 100 points, that is a 6 point spread. Tim clearly thinks it is a world class wine. Please shed some light. As South Africa’s leading wine commentator I am always interested in your local take on things. Hi Dionysus, Essentially, I think the report is all grist to the mill – the more high-profile international commentators taking a keen interest in South African fine wine, the better for the industry. As for the differential between my score and Tim’s for the Kanonkop Paul Sauer 2015, I’m not sure I can add much insight – I liked it and he liked it even more. I would contend that 94/100 does indicate a “world-class” wine while 100/100 indicates “perfection” which, in the context of all human endeavour and considering the concept in a philosophical light, is not readily attained. I just wonder whether the producer and vintage does not oblige this perfect score. because if you are not going to score arguably the most iconic SA wine from the most iconic estate and from the most praised vintage a perfect 100, when will you ever? and the critic to be the first to do that also gets to win the scoring race. I have tasted the 2015 Sauer, it is very good, but if it is worth 100 points then there are quite a couple of other wines worthy of the same score. If Tim Atkin feels he will never come across better, no problem and huge congrats Kanonkop. Hennie I think it needs to come down to the wine in the glass, not the theory of Producer+Vintage=Must be maximum. In my opinion, 100/100 is reserved for a wine that you are confident you’ll never taste better; on par – fine, but no other wine you come across in future can be better otherwise your scoring was incorrect. Big feather in Kanonkop’s cap. I understand he said in interview, yesterday, that it was somewhat of a reaction to Wine Spectator awarding some exorbitant number of 100’s to Aussie wines over the years. Basically saying it’s bull and that this wine is at least equivalent to those, and that it’s about time we started seeing some SA wines getting full marks in the press.